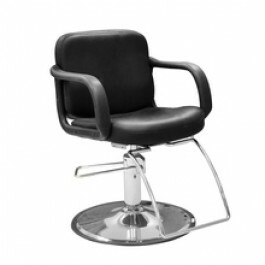 AYC TD-6876-A-13 PRESTON ll Styling Chair: Preston 2 Styling Chair is a classic rich black economically designed chair. This is a great trendy buy for any starter salon. It has style, practicality, and durability. Features include u-shaped chrome footrest, chrome hydraulic base, chrome lever for easy adjusting, and soft back and seat cushions for comfort. Available with stitching. Contemporary design with curved arms. Back and seat are upholstered with extra cushion to provide maximum comfort. Dimensions: L 32" x W 24.5" x H 36.5"